9. Compensation and Benefit: As per Government Pay-scale. 13. Educational Qualification: FCPS/FRCM/MS/MD or Equivalet Recognized Bangladesh Medical and Dental Council. 14. Salary and facilities: Bangladesh defense salary and facilities. a. First pay 1000/- any Mobile Banking. b. Please prepare recent passport size photo within 100KB Bangladesh Navy specific size. f. Input your Pay Information. Bangladesh Army Recruitment authority Mobile SMS declaration will be published Call Up Letter. Every applicant can download login with User Id and Password at http://joinbangladesharmy.army.mil.bd/. Bangladesh Army Recruitment authority Mobile SMS declaration will be published Seat Plan and Exam Center at your Call Up Letter. You can download Call Up Letter login with User Id and Password at http://joinbangladesharmy.army.mil.bd/. Bangladesh Army Recruitment authority will be published at their Official website notice board [Result ##eye##]. 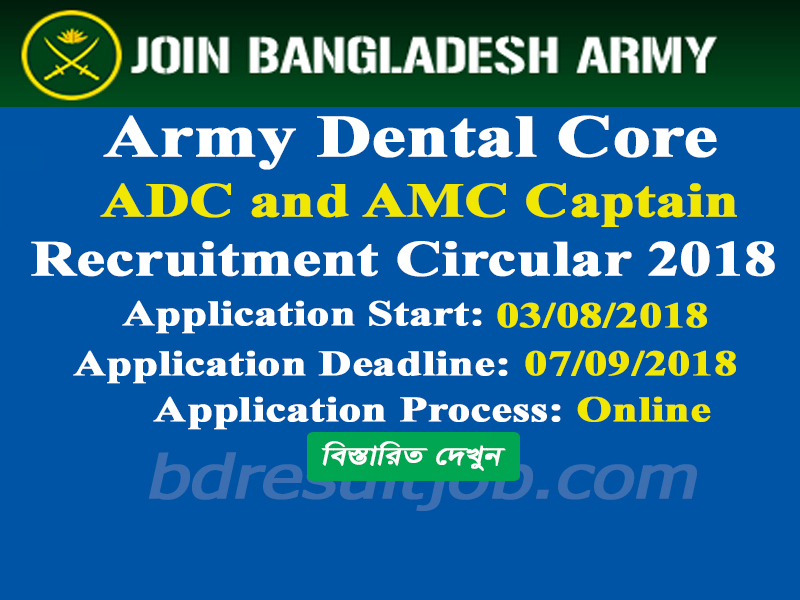 Tags: www.joinbangladesharmy.mil.bd, www joinbangladesharmy mil bd, AArmy Medical Core/Army Dental Cor 72th AMC and 63st ADC Captain circular 2018, Army Medical Core/Army Dental Cor 72th AMC and 63st ADC Captain Recruitment Call Up Letter Download, Army Medical Core/Army Dental Cor 72th AMC and 63st ADC Captain Recruitment online application, Army Medical Core/Army Dental Cor 72th AMC and 63st ADC Captain Exam Result. 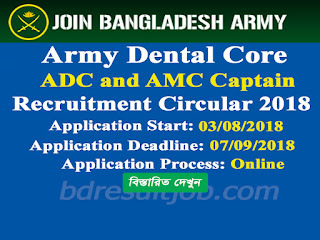 www.joinbangladesharmy.mil.bd, www joinbangladesharmy mil bd, AArmy Medical Core/Army Dental Cor 72th AMC and 63st ADC Captain circular 2018, Army Medical Core/Army Dental Cor 72th AMC and 63st ADC Captain Recruitment Call Up Letter Download, Army Medical Core/Army Dental Cor 72th AMC and 63st ADC Captain Recruitment online application, Army Medical Core/Army Dental Cor 72th AMC and 63st ADC Captain Exam Result.